This online exhibit highlights the History of the College and showcases archival audiovisual materials recently digitized with funds provided by the Institute of Museum and Library Services through the Library Services and Technology Act administered by the Utah State Library. Documentation of the accompanying physical exhibit as well as the concurrent Interactive Sculpture (Taylorsville-Redwood Campus Library, Main Floor) and Digital Story celebrating the 20th Anniversary of the Markosian Library are included below. This dynamic interactive timeline documents the history and evolution of the Salt Lake Community College from its beginnings as Salt Lake Area Vocational School in 1949 through the 21st century. 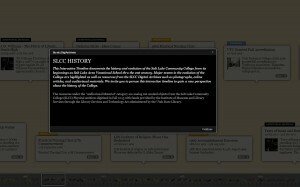 Major events in the evolution of the College are highlighted as well as resources from the SLCC Digital Archives such as photographs, online articles, and audiovisual materials. We invite you to peruse this interactive timelineto gain a new perspective about the history of the College. The Salt Lake Community College Digital Archives collects and provides access to archival materials related to the history of the College from its inception in 1949. Tune in here to view contemporary digital stories, advertisements, graduation ceremonies, convocations, special guest speakers, and other intriguing audiovisual resources. Below are three such videos available to the public. Access all the SLCC Digital Archives Audio Recordings that were recently digitized at Mixcloud. 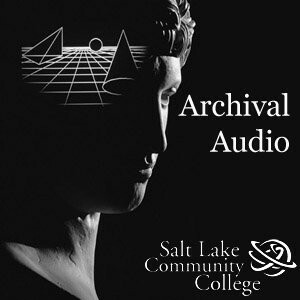 The recently digitized archival audio recordings are currently accessible through the SLCC Digital Collections or through the SLCC_DigiArchives channel on Mixcloud. The audio materials include a variety of resources such as College advertisements, talk radio shows, graduation ceremonies, convocations, special guest speakers, and other intriguing audio recordings about social concerns. Some of the most unique audio recordings are from the 1960s and 1970s when the U.S. was embroiled in turmoil overseas as well as at home. Against the backdrop of the Vietnam War and Communism, these audio recordings include guest speakers such as Cleon Skousen and the “Hollywood Bowl on Communism” colloquium with Senator Thomas J. Dodd as the key speaker. As Utah Technical College at Salt Lake (UTC), the College had a tradition of broadcasting radio talk shows; a tradition which continues at the College today. In addition to other KLUB radio broadcasts with news about current events and the College, “Se Puede” is an audio recording of a 1977 UTC Talk Show with music interludes and a humorous dialogue about different College employees including President Jay Nelson. In conjunction with the 20th Anniversary of the Markosian Library at the SLCC Taylorsville-Redwood Campus, Digital Archives has created a digital story about the Markosian Library focusing on the question “What does the Library mean to you?” The digital story is part of the interactive sculpture using audio recordings of library staff members with visuals of the Markosian Library to generate a collective story which reinforces the idea of library staff as stewards for service and student needs. The physical exhibit includes an interactive sculpture, a digital story about the Markosian Library discussed above and a selection of digitized materials in display cases featuring a digitized time lapse of the college center and an ipad linked to the interactive timeline. The interactive sculpture is a “room” created by netting long strands of rope dangling from an overhead trellis system. The interactivity of the piece promotes patron involvement and initiates a creative approach to developing an anonymous and transparent feedback system that the Library can use for future data assessment and memorialization.